It's been a while since I last updated. 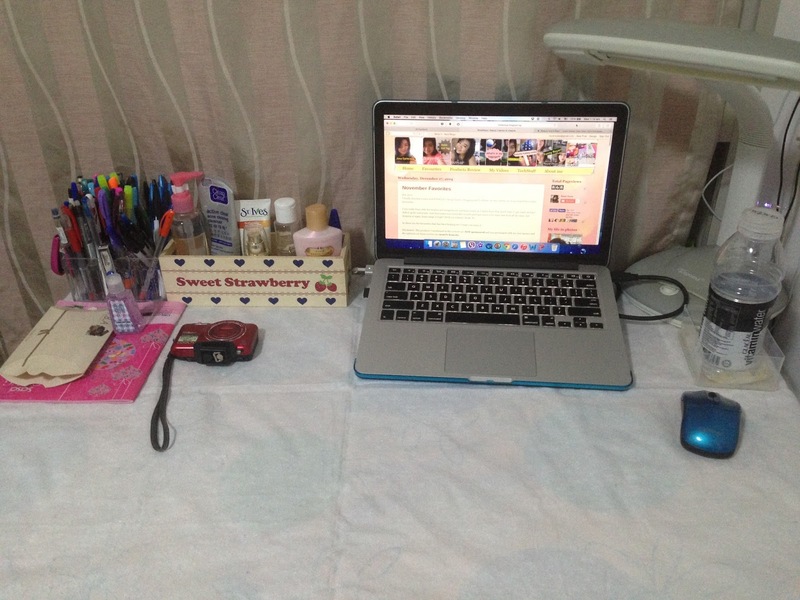 Today I want to share with you all my working space/ blogging space/ YouTube filming session. So I have my laptop of course. The heart of the blogging. Well I use MacBook Pro 13'' with Retina Display. Well, mine is the late 2012 version so it's a bit late but it's still functioning for me and I really love it. I have both Windows partition and Mac partition installed due to my IT major in University. Mostly I use the Mac version for my YouTubing, Blogging stuff. And my Windows for school stuff. 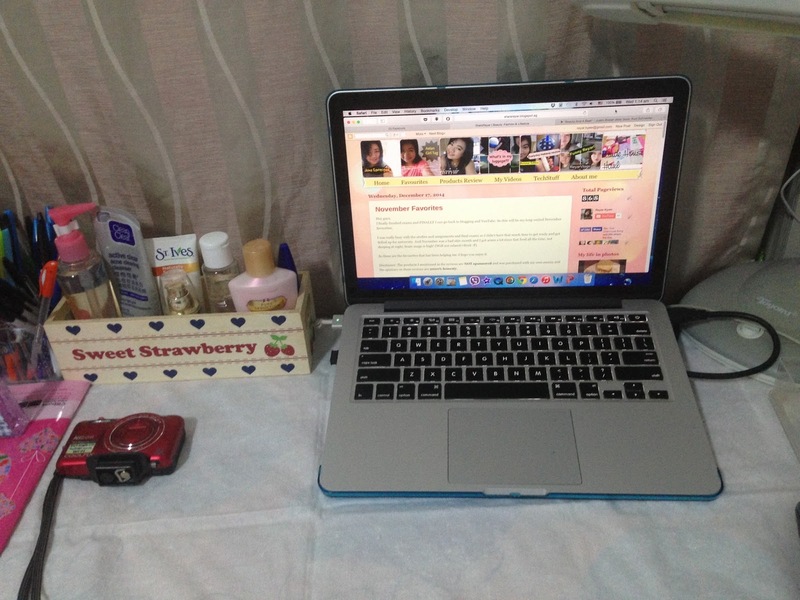 Beside my laptop to the left is my little wooden block with the products I am blogging each week. This week I have Daiso Cleansing water, Clean & Clear active clear acne clearing cleanser, St. Ives Oatmeal and Shea Butter Lotion, L'Oréal True Match Foundation, Silk-n-Shine Frizz control Hair serum, Victoria Secret Pure Seduction Body Lotion and last but not least Maybelline New York the Rocket Voulm' Express Mascara. 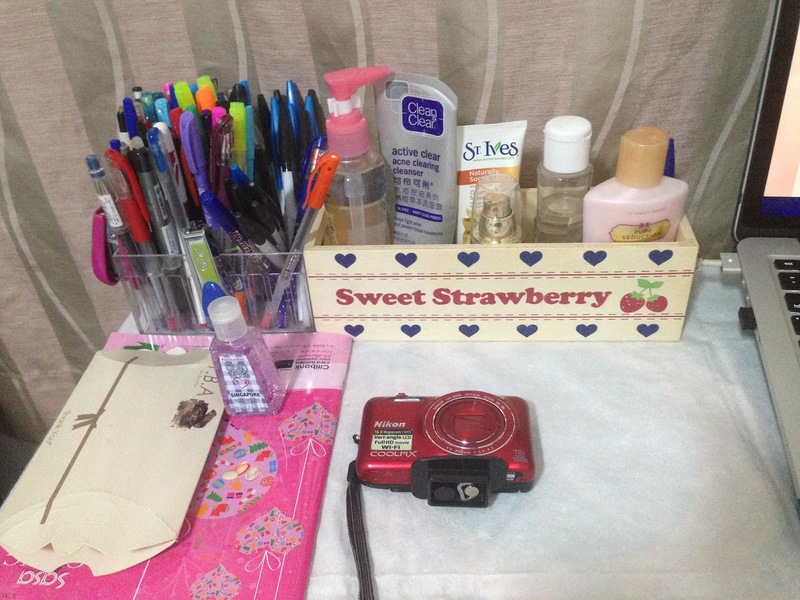 And if you are wondering where I got my little Sweet Strawberry Tray, I got it from Daiso. I have my camera from Nikon Coolpix S6600 camera for both my blogging photo shoots and my YouTube videos. Beside the tray, I have a bunch of pens lying around since I love doodling and for the school as well. Beside my camera, I have a SASA pamphlet and my bath and body works hand sanitiser.